VoIP is nothing new, but it is something wonderful. It stands for Voice over Internet Protocol; it’s a phone service over the internet. Since VoIP converts your conversations into a digital signal, you can opt to make calls using soft services, which consists of software on a computer or smartphone or use hard services which let you make calls using an analog desk phone. Don’t think of these services as exclusive, but rather as complementary. In fact, many small businesses use VoIP for both soft and hard services because it allows you to work fluidly when you move away from your desk and even translates voicemails to email while you’re mobile. VoIP is popular because it provides small businesses with the same tools and opportunities as large businesses without having to pay big business prices by delivering call forwarding, voicemail and conferencing all in one, scalable resource. If you don’t know what you’re doing, migrating to VoIP can slow your business down and cause a lot of headaches. So how do you avoid these problems? One factor crucial to the success of your VoIP efforts is selecting the right VoIP provider. 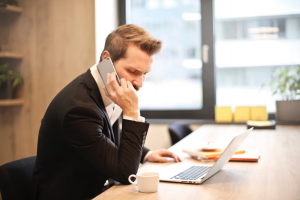 Many businesses position themselves as the top-tier or “luxury” VoIP provider, but it’s not all about picking the most expensive service or the highest-rated vendor out of a Google search. What’s important is finding the provider who is a good fit for your business. Signing up for VoIP bundling often enlists you in a whole realm of services which you might not even need. You should pick the service that offers what is best for your business, not the one that offers everything under the sun with the price tag to match. Why pay for tools like live-screen recording or the ability to monitor a call center if you won’t use them? After all, one benefit of VoIP is that it reduces your hard phone services cost. The best thing about VoIP is that it’s flexible and scalable, so you can always add features when you’re ready for them. No new service is without its drawbacks. It’s essential to fully evaluate the pros and cons of a service before making a decision that could impact your business. One shortcoming of VoIP is that it relies on your Internet connection to operate. So, if you’re internet plan doesn’t have the bandwidth to support a lot of activity or if your server and/or routers aren’t configured correctly for optimal speed, you may be biting off more than you can chew in terms of business communications solutions. Another issue is security. Once you introduce computers to the equation, you have to prepare cybersecurity measures to account for your VoIP. While there are additional risks to attaching your phone services to the Internet, the same processes you take to update and secure your software will account for your VoIP. If security is a particular concern of yours, you may want to get a VoIP plan that includes encryption with specially configured VoIP firewall. Take a good, hard look at your current and future bandwidth needs. For many small- and mid-sized businesses, it’s a no-brainer. Likewise, for larger entities, providing your team with access to business communications while they’re mobile could help convert leads and create higher business efficacy. Every organization is unique and so are its processes. Make sure you find a VoIP provider who understands your business needs and can help build a reliable VoIP infrastructure and position you for growth. If your research gets a little over your head, don’t worry. You can seek out a specialist familiar with VoIP packages and infrastructure management who can facilitate the initiation and setup of your telecommunications solutions. These specialists present a single point-of-contact to manage the moving parts of a voice and data provider. Additionally, they’re familiar with what offers and opportunities are currently available for your business and will be able to set you up for success by brokering the relationship. If you don’t know any such specialists, you’re in luck, Bandwidth Simplified provides recommendations for solutions that will empower your organization to achieve your goals. If you’re curious about VoIP packages and want to know more about finding the right solution for your business, fill out our organization assessment to get insights from our experts. ← 2017 Polycom Phone Trade-in Rebate!